Slightly Dangerous, Entirely Delicious - The More I Read. . .
How could I not love Slightly Dangerous with its echoes of Pride & Prejudice? I first read this book in 2008 or thereabouts, and as I carefully thumbed through my very well worn copy this week for yet another reread, I saw dialogue I'd underlined and notes in the margin or happy/sad faces nestled close to those places that made me smile or shed a tear or three, maybe an exclamation mark here and there or a heart encircling a page number of a well-loved passage. My copy is so well read, pages are falling from it. I simply love Wulfric Bedwyn and Christine Derrick, and this final book of the "Slightly" series never, ever disappoints me. 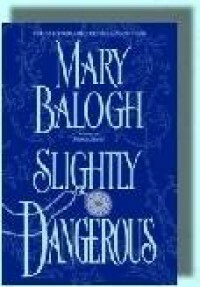 I believe Slightly Dangerous holds the distinction of a finale book in a series that did not fall to pieces or disappoint in any way or excise all the interesting aspects of that one character you've been glimpsing throughout a series, and each peek just whets your appetite for that book when he/she is the star. I remember when I read Slightly Tempted, and Alleyne Bedwyn was thought to have died at Waterloo, I was so moved by Wulfric's very private and very heartfelt grief. It was shortly after Morgan returned to England, right after Alleyne's memorial service, and she wanted the comfort of her oldest brother's presence. She finally finds him in his library, his head bent, leaning on the fireplace, weeping. She does not disturb him or let him know she had seen his loss of control. But it is a very important scene in that book and an integral part of his character arc over the series. He has always appeared to be cold, aloof, uncaring, detached from the mortal realm, more concerned with his social consequence than emotions like love or compassion or frivolity. But there's that scene in the library at Bedwyn House and glimpses of other moments in this series that hints at the intriguing idea that there is quite a bit more to the Duke of Bewcastle than what is clearly visible on the surface. Wulfric Bedwyn has layers and facets and complexity. One of the scenes that reveal his depth and vulnerability is when Wulfric refutes Christine's accusation that he wears a mask. Such a great scene, there at the dovecote, that very private sanctuary for him where the Duke of Bewcastle can remember that he is the man, Wulfric Bedwyn, too. How and why Wulfric ends up at a house party (and he detests house parties) where he is besieged by noise and frolic and nonsense and chits just out of the schoolroom flirting with him also offers hints of vulnerability. How did he get there? Well, because he experienced a touch of self-pity and loneliness associated with empty nest syndrome now that his last sister, Morgan, has married and moved away, and his mistress of ten years had recently passed away. He is not naturally a solitary man even though he has grown accustomed to that state. And that's the beauty of this book. He is a very complex, fascinating character as is Christine. Though she appears happy-go-lucky, sparkles from within, the life of any party, there is a darkness in her at times. A darkness that Wulfric recognizes while others do not. May I add perceptive to his many sterling qualities? Wulfric is all those things that people find so off-putting, but he also has a dry, subtle humor, an underlying loneliness, and a surprising vulnerability. Christine is more than just an effervescent, slightly clumsy, always happy lady. She feels the snubs by the ton very deeply, she is wounded by the gossip that ruined her relationship with her brother- and sister-in-law, she still feels the heartache of the problems associated with her marriage to Oscar. There's more to both these characters than meets the eye. And speaking of eyes, I admit it. I love that whole quizzing glass affectation Wulfric was so fond of. After all, it was Christine's very direct gaze and one of his infamous quizzing glasses that brought these two together in the first place. And then all Christine's complacency fled as her eyes met the Duke of Bewcastle's across the room and she had instant images of jailers and jails and chains and magistrates flashing through her head. Her first instinct was to efface herself utterly and lower her eyes in an attempt to fade into the upholstery of the chair on which she sat. But self-effacement had never been her way of reacting to the world's ways - except perhaps in the last year or two before Oscar died. And why should she seek to disappear? Why should she lower her eyes when he was making no attempt to lower his? And then he really annoyed her. Still looking at her, he raised one arrogant eyebrow. And then he infuriated her. With his eyes on her and one eyebrow elevated, he grasped the handle of his quizzing glass and raised it halfway to his eye as if utterly incredulous of the fact that she had the effrontery to hold his gaze. One of the scenes I love to bits in Slightly Dangerous is the quarrel Christine and Wulfric have after she inadvertently rolls down a hill. Yes, I said "rolls down a hill" and yes, it was inadvertent, though entirely predictable. Don't ask. Just read the book. All will be clear. "And you, Mrs. Derrick," he said, taking a few steps away from her and then turning to look back at her, "know no other way of fighting your attraction to me than to convince yourself that you know me through and through. Have you decided, then, that I wear no mask after all? Or that you were right last evening when you said that perhaps I was simply the Duke of Bewcastle to the core?" "I am not attracted to you!" she cried. "Are you not?" He raised one supercilious eyebrow and then his quizzing glass. "You have sexual relations, then, with every dancing partner who invites you to accompany him to a secluded spot?" Fury blossomed in her. And it focused upon one object. "That," she said, striding toward him, "is the outside of enough!" She snatched the quizzing glass out of his nerveless hand, yanked the black ribbon off over his head, and sent the glass flying with one furious flick of her wrist. I'm not sure when I've laughed so hard and so long just from a few paragraphs in a book. Each and every time. Though it wasn't the first time Christine had fantasized about ridding Wulfric of his quizzing glass, it was the first time she actually followed through on her fantasy. (She imagines earlier that she is stuffing the quizzing glass down Wulfric's throat and watching with glee as it made its way down sideways, bulging out the sides of his neck.) The glass is retrieved from the tree, but this particular one becomes Christine's property. Not to worry, Wulfric has a stash of seven, (yes, seven!) more and all equally offensive quizzing glasses. That same quizzing glass shows up again at the Easter Holiday ball at Lindsey Hall. Wulfric invited Christine and her in-laws to Lindsey Hall as his "secret" guest of honor. It was an opportunity for her to get to know him better after his first disastrous marriage proposal (one that both recreates the tone and tenor of Mr. Darcy's to Elizabeth but is totally unique to Wulfric and Christine). This was his opportunity to demonstrate to her that he was someone who possessed at least some of the attributes of the man she might consider marrying - a list he had committed to memory - "a warm personality, human kindness, and a sense of humor. He must love people, particularly children, and frolicking and absurdity. He must be a man who is not obsessed with himself and his own consequence. He must be someone who is not ice to the core. He must be someone who has a heart. He must be capable of being [her] companion and friend and lover." And his plan is to culminate with the ball and a particular question that he will ask her again afterward. Her eyes met his across the empty floor. He could not resist. His fingers grasped the jeweled handle of his quizzing glass and raised it all the way to his eye before lowering it slightly. Even across the distance he could the laughter well up in her eyes. And then she reached down into the little cloth reticule that hung from her wrist and brought something out of it. For a moment all he could see was black ribbon. She brought the object slowly up to her eye and regarded him - through the lens of his own quizzing glass. Wulfric Bedwyn, the oh-so-toplofty, oh-so-frosty Duke of Bewcastle, was shocked into uttering a short bark of laughter. Then he smiled at her slowly until his whole face beamed his amusement and affection. She was no longer smiling, he saw as he set off across the empty floor toward her - it did not occur to him that it would have far more correct to walk unobtrusively about the perimeter of the room. But her eyes were huge and translucent, and her teeth were biting into her lip. "I believe, Mrs. Derrick," he said, making her a bow when he came up to her, "this is my dance?" "Yes, your grace," she said. "Thank you." It was only then, when he extended a hand toward her, that he became aware of the near-hush that had descending on the ballroom. He turned his head and looked about in some surprise, his eyebrows raised, to see what had happened. But as he did so, everyone rushed back into conversation. "Did I miss something?" he asked. Christine Derrick set her hand in his - the quizzing glass had disappeared inside her little reticule again. "Yes," she said. "A looking glass. You missed seeing yourself smile." What the devil? He frowned at her. Reading Slightly Dangerous has become almost an annual reread for me over the years. As I was reading it again this week, I thought I really should at least try to write some sort of review for this wonderful book. If you haven't read Slightly Dangerous, I really hope you do. It's Mary Balogh doing what Mary Balogh does best.